For this dish I used chicken liver but you can use beef liver if you prefer. Its easy to make and can be eaten with rice, bread or even toast! Spices: 1 tsp of cumin powder, 1 tsp of chilli powder, 1 tsp coriander powder, 1/2 tsp of turmeric, 1/2 tsp of curry powder, 1 tsp of salt. 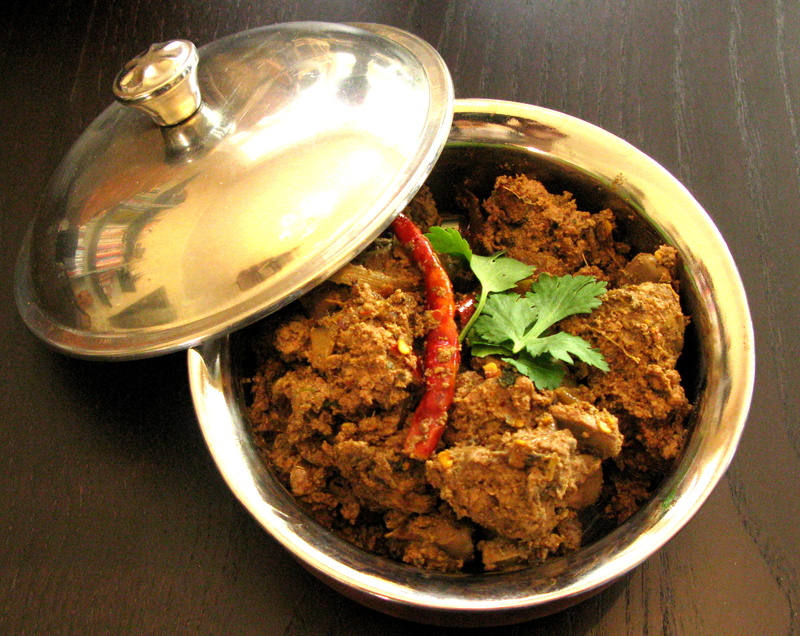 Note: Alternatively, you can use “Shan Liver Curry” spice mix found in almost all Desi stores. 1. Wash the chicken liver really well and cut into small cubes if not pre-cut. Drain well. 2. In a bowl, mix the liver and all spices indicated above along with the salt and crushed chilli peppers. Mix well. 3. Using a saute pan, heat up 2 tablespoons of oil on a high heat and add the liver. Saute until 1/3 cooked and set aside. 4. In another pan, heat up 1 tablespoon of oil and add 1 thinly sliced onion. Fry for a minute or two until almost brown and then add the crushed or blended garlic and ginger. Fry for a further minute and then add the whole red chilli peppers. 5. Cut and add the tomato and fry for a further minute until the onion has softened. You can add a sprinkling of salt at this point. 6. Add the liver and lower the heat to medium to allow the liver to cook thoroughly, about 10-12 minutes. No need to cover as you want the liver to dry up a fair bit since this is a bhuna (dry massala) dish. 7. Once done and the liver has dried up, add a handful of fresh coriander leaves and remove from heat. Recommendations: Best served with almost any type of bread or rice of your choice. Kichuri goes really well with it. Hi, thanks very much for a wonderful recipe and keep up the excellent work. Your recipes are easy to follow, the ingredients are all easily available and most of all are very very quick. Thanks once again. By the way do you know how to make ‘nunor bora. Hi Hema, re nunor bora, unfortunately I don’t. I would suggest that you ‘like’ my deshigrub facebook page and post a comment on there asking. Perhaps someone can send you the recipe. Good luck and thanks for your comment. So when the doc told me to eat an iron rich diet and suggested offal, my immediate thought was “hmm”. I’d never cooked liver before, haven’t eaten it other than as pâté for 20+ years. This was a revelation. Simple recipe to follow, I used a 400g pack of chicken livers trimmed to remove the less attractive bits, halved the spice quantities but used lots of garlic / ginger paste & dried chillies, added some (cooked) broad beans & fine green beans at the “tomato” stage and ate the lot with plain boiled basmati. Used one tbsp oil in all, 835 calories for an absolute feast – delicate liver, heady aromas, some warmth but not too much. Winner of a recipe, I’ll make this one again and again. Thank you!